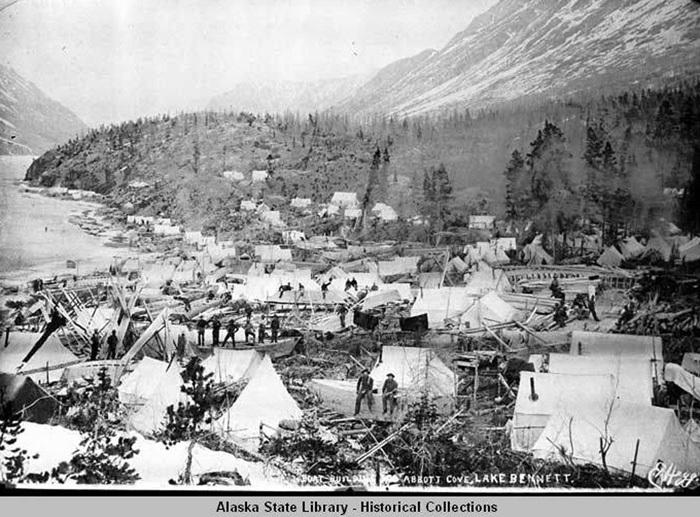 The Klondike Gold Rush of 1896-1900 gets all the attention. The truth is that people caught gold fever years before. The California Gold Rush of 1848 started it all. Rumors spread quickly. Someone must have heard the one about Russians finding gold on the Kenai. Americans were coming to Russian America searching for gold years even before Alaska was sold to the United States. In 1861, miners found gold at Telegraph Creek in British Columbia. Others found gold in Wrangell. Miners trickled north. A few got lucky in Juneau, Sitka, Yakutat area, and near Sunrise on the Kenai. They even made their way into the Interior, where they struck gold at Fortymile and Circle City. This was all before the mega strike in 1896 in the Yukon started the big rush. 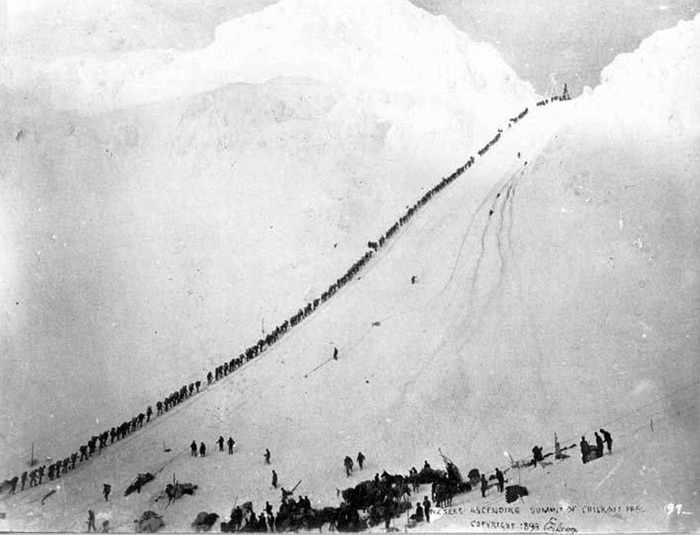 In all, about 100,000 people headed for the Klondike in hopes of getting rich. Only about 40,000 actually made it. Many of them came too late. All the claims were staked. People came from all over the world, but most were from the United States. The economy in the rest of the country was pretty grim. Many rushed north thinking gold was a ticket out of the poor house. Few thought about how hard it would be to get there. 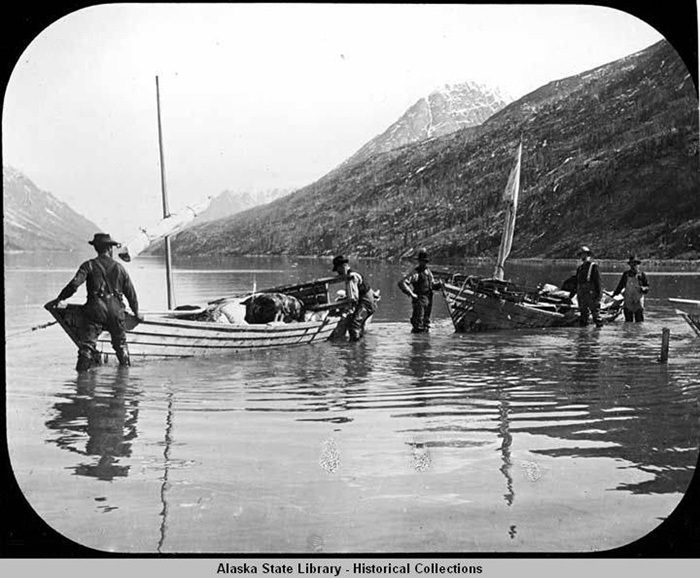 Most of the gold seekers came by steamship from Seattle to the Alaskan ports of Dyea or Skayway. The Canadian Mounted Police would not let miners go any farther if they didnt have a year's worth of supplies. 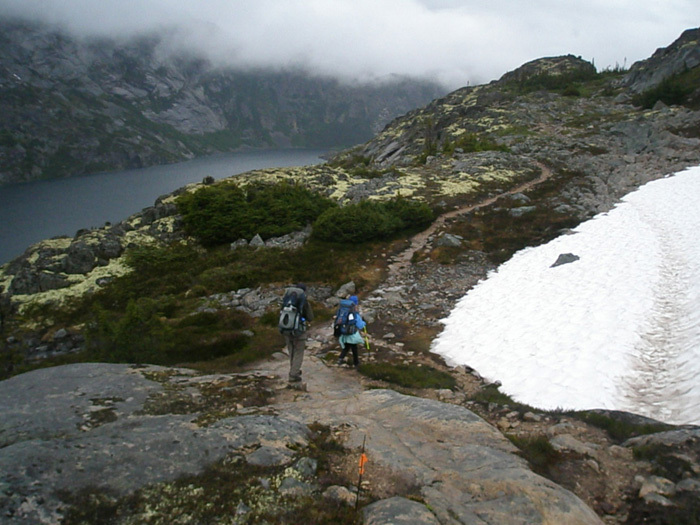 Once they got their ton of gear, they made their way over the 40-mile Chilkoot Pass. They couldn't carry all that gear at once. Several trips were needed. It was a brutal trek. Not quite at the halfway point, now called Dead Horse Gulch, thousands of worn out and abused pack animals died in the rush. In April 1898, an avalanche came roaring down on a group of miners. They had just made their way up the Golden Stairs just below the summit of the pass. The avalanche buried 63 of them. Once over the summit, miners made their way to Lake Bennett or Lake Lindemann in Canada. 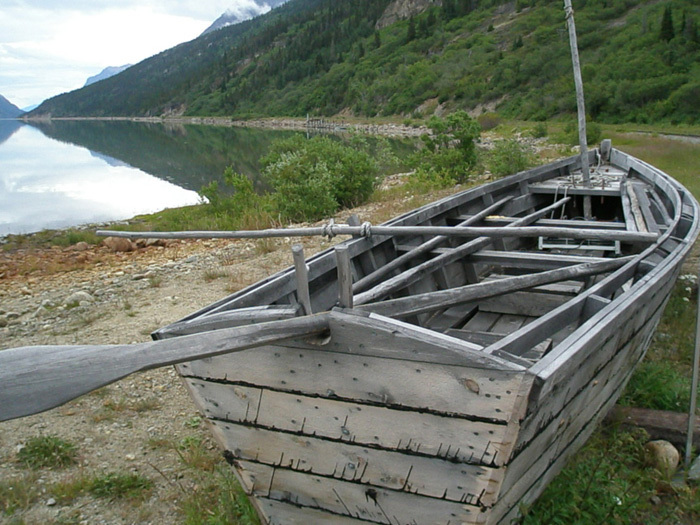 Here they built boats to float the final 550 miles to Dawson and the gold fields. In just one week in May 1898, 7,000 boats left the ice-free lakes. By 1900, the White Pass and Yukon Railway was finished and made the trip from Skagway to the lakes much easier. 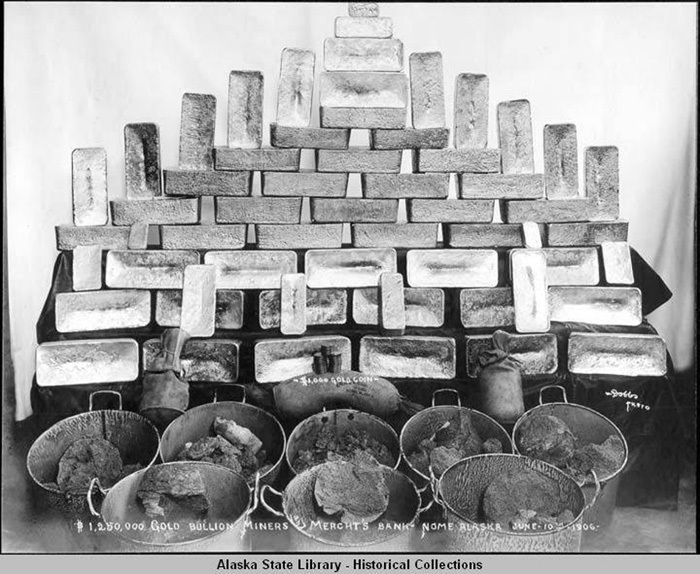 The Klondike produced some $300 million in gold. Even though everyone did not get rich, the north would never be the same. Thousands of gold seekers roamed Alaska following rumors of gold across the state. 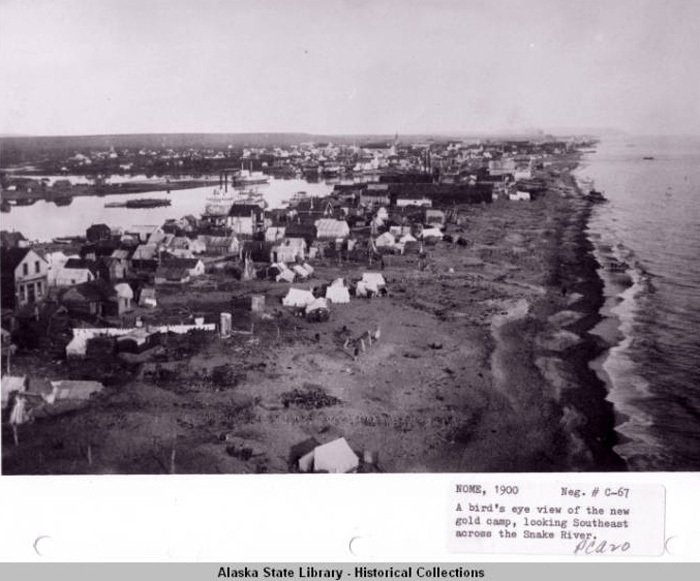 Gold found on the beaches in Nome touched off a new rush to the Seward Peninsula in 1899. 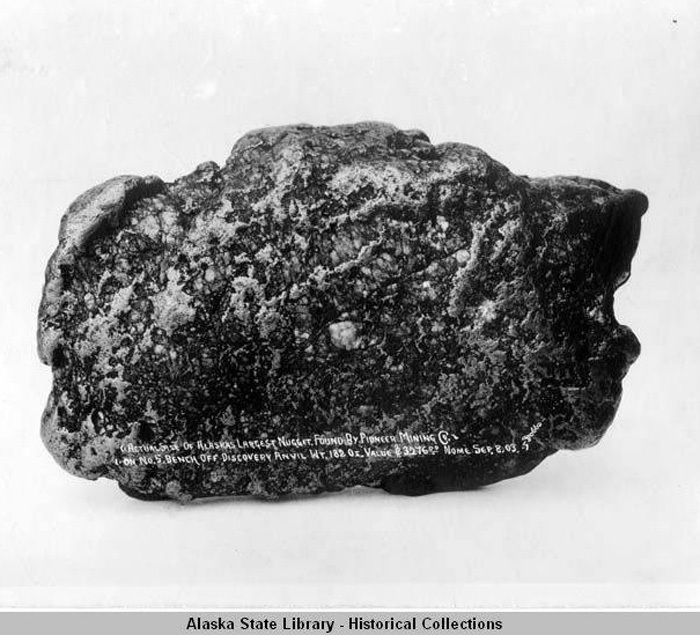 In 1902, Felix Pedro found gold near Fairbanks. Other strikes brought more people to Kantishna near Denali, and to Iditarod, in the Kuskokwim area. Gold continues to incite dreams of riches today. In fact, the biggest nugget ever found was discovered in 1998. It weighed 24.5 pounds and was found near Ruby in Northern Alaska. Alaska's History by Harry Ritter, Alaska Northwest Books, 1993. Alaska Almanac, 32nd edition, Alaska Northwest Books, 2008. 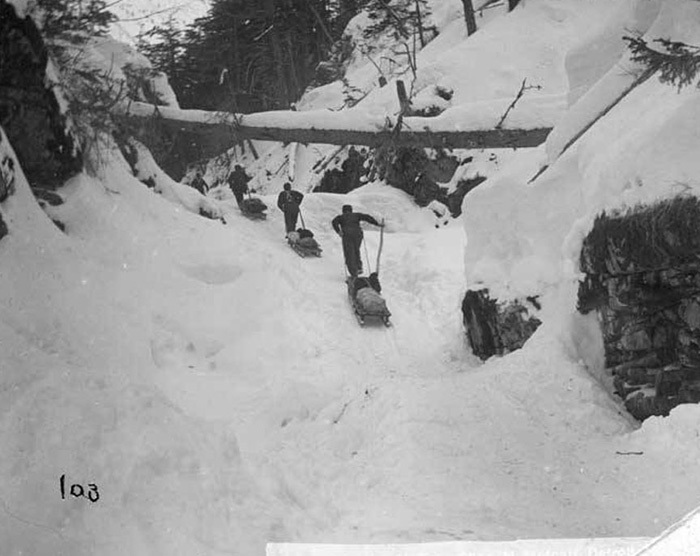 Chilkoot Trail Men pull sleds on the snow-packed trail through Dyea Canyon to Sheep Camp on the Chilkoot Trail in 1897. Boat Relic at Lake Bennett	An old boat frame at Lake Bennett is one of many relics left from the gold rush.